Sean Reilly and Cotton Malone finally join forces... with some other surprise guests too, in this FREE EXCLUSIVE SHORT STORY, ONLY AVAILABLE HERE ON MY WEBSITE. Just click on the READ EXTRACT link below to download the whole story, and ENJOY! From New York Times bestselling authors Raymond Khoury and Steve Berry comes a unique and wildly original short story. It’s been ten years since FBI agent Sean Reilly and retired Justice Department operative Cotton Malone got dragged around the globe on their separate Templar adventures. They’d never worked on a case together—until now. Something’s afoot in London, England. American specialists have gone missing. Intel chatter points to a major terrorist plot in the works. And a familiar keyword links to both Reilly and Malone. The two agents are urgently despatched to London where they discover a plot that’s more personal, and more surprising, than they could have possibly imagined (and one that may involve a couple of writerly characters new to fiction whom you might recognise. Hint: one of them’s bald). 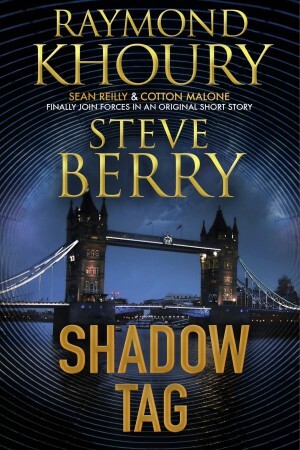 Fast, furious and funny, Shadow Tag is like nothing you’ve read before.